Iraq appears to be cooperating with Turkey in security measures against Kurdish separatist insurgents in northern Iraq. 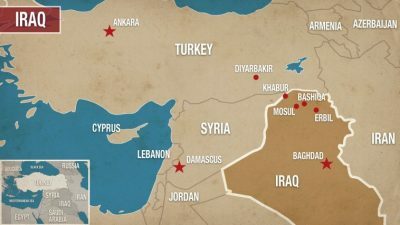 Over the last 48 hours Turkish and Iranian troops have been conducting large scale military drills on the border with Iraq as Kurdish separatists in northern Iraq have voted in a unilateral referendum of secession which has been widely condemned by all regional powers except Israel as well as being condemned by both Russia and the US. Today, it has been confirmed that Iraqi troops have joined their Turkish counterparts on the Turkish side of the border in what may be preparatory stages for a joint operation in northern Iraq against separatists who maintain their own insurgent militia called the Peshmerga. Yesterday, in a Kurdish controlled referendum, 93% of registered local separatists voted to leave Iraq. Arabs and Turkomen have boycotted the vote which they believe to be illegitimate, in line with the position of Iraq, Turkey and Iran. Now watch the live footage of the joint Turkish-Iraqi military drills.